As was the case on Friday, the morning session on Saturday began bright and early at 7:00am. Team Boll (Columbia) scored three goals in the second half in route to a 5-2 win over Team Johnson (Grey). Team Boll improved to 2-1 with the win, while Team Johnson dropped to 1-2. Much like yesterday's 7:00am game, I thought the flow of this game was a bit sloppy and disorganized at times. Scoring goals for Team Boll was Grant Baetsen, Dominick Mersch, Chayse Primeau, Jakob Kranabetter, and Lubos Vacek. Scoring goals for Team Johnson was Sander Boroczky and Grant Anderson..
As I stated yesterday, Team Boll has three goaltenders on their roster and it's a bit confusing trying to track them coming in and out of these games. Netminders Tommy Nappier and Tanner Holmes each gave up only one goal a piece during their time in net, while Brady Boudreau did not give up any goals. Team Johnson goaltender Cody Gibson started the first half of the game and gave up 2 goals. Team Johnson goaltender Quentin Prokopetz started the second half and gave up three goals. Players from Team Boll who stood out to me were Max Humitz, Tristan Mullin, Lubos Vacek, Chayse Primeau and the goaltending trio of Nappier, Holmes, and Boudreau. My MVP of Team Boll goes to defenseman Lubos Vacek from Czechoslovakia. This is just my worthless opinion as a blogger, but I really hope the Stars can find a place on their roster for Lubos. He goes about his job quietly, but he's a very efficient skater and has a terrific first past out of the defensive zone. I'm a big fan of this kid. Players from Team Johnson who stood out to me were Cameron Lee, Jack Badini, twins AJ and Christian DiCesare, and Grant Anderson. 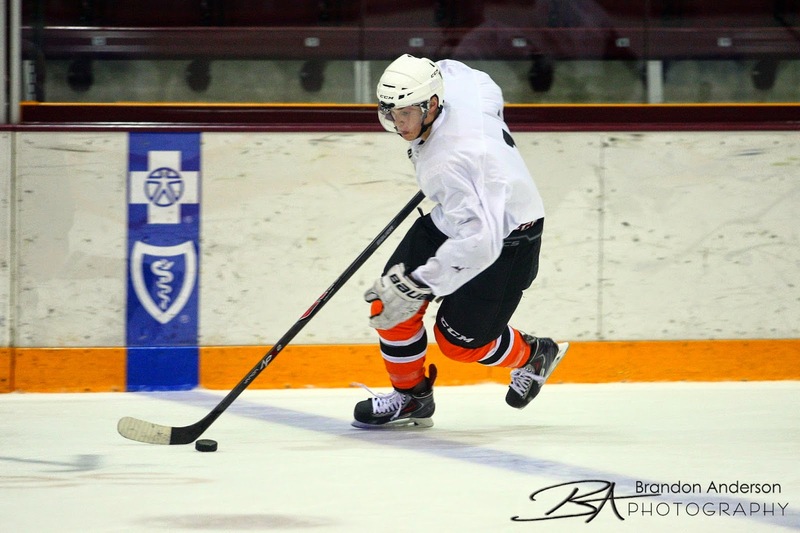 My MVP of Team Johnson goes to forward Jack Badini who is putting together a very impressive camp. He's only a '98, but he does not look out of place. In a close one, Team Dzingel (Yellow) skated to a 4-3 overtime shootout victory over Team Bartkowski (White). With the win, Team Dzingel improved to 2-1 while Team Bartkowski fell to 0-3. Scoring goals for Team Dzingel was Harrison Aide, Patrick Cozzi, Josh Bell, and Tye Ausmus (overtime shootout game winner). Scoring goals for Team Bartkowski was August von Ungern-Sternberg, Conner Blanck, and Evan Johnson. Team Dzingel goaltender Josh Creelman played the first half of this game and pitched a shutout. Team Dzingel netminder Tanner Creel played the second half of the game and gave up three goals. Team Bartkowski goaltender Hunter Shepard started the first half of the game and gave up one goal. Team Bartkowski netminder Parker Butler started the second half and gave up two goals, and the lone shootout goal. Players from Team Dzingel who stood out to me were Tye Ausmus, Biagio Lerario, Patrick Cozzi, Harrison Aide, and Josh Bell. For my MVP of Team Dzingel, I'm going to give some love to goaltender Josh Creelman. Although he only played one half, Creelman did a fantastic job in the first half of this game keeping Team Bartkowski off the scoreboard. Players from Team Bartkowski who stood out to me were August von Ungern-Sternberg, Conner Blanck, Wyatt Kalynuk, Casey Dornbach, and Tristan Rostagno. My MVP of Team Bartkowski goes to forward August von Ungern-Sternberg. August is a very talented player who I believe is more than ready to make the jump up to the USHL level. He was around the puck all game long creating havoc. On the strength of four 2nd-half goals, Team Bollig cruised to a 5-3 victory over Team Backes. With the win, Team Bollig improved to 2-1, while Team Backes lost their first tryout camp game and fell to 2-1. Scoring goals for Team Bollig was Luke Voltin (2), Endre Medby, James Ladouce, and Dominick Sacco. Scoring goals for Team Backes was Michael Miller, Angus Scott, and Wes Michaud.. Team Bollig goaltender Peyton Jones played the first half of this game and pitched a shutout. Team Bollig netminder Jake Berger played the second half of the game and also gave up one goal. Team Backes goaltender Jacob Nehama played the first half and gave up one goal. Team Backes netminder Holden Kurtz started the second half and gave up four goals. Players from Team Bollig who stood out to me were Peyton Jones, Will Scherer, Chris Klack, Luke Voltin, Dominick Sacco, and Endre Medby. My MVP of Team Bollig goes to forward Luke Voltin, who played most of last season with the Stars before he was sent to Minot of the NAHL. Voltin has size, speed, and great hands, all of which was on display in this particular game. Players from Team Backes who stood out to me were Jacob Nehama, Ryan Jones, Angus Scott, and Wes Michaud. My MVP of Team Backes goes to forward Wes Michaud who has come out of nowhere as a free agent to really have a great camp. He's a bit on the small size, but plays with no fear and manufactured a ton of offensive chances in this game.